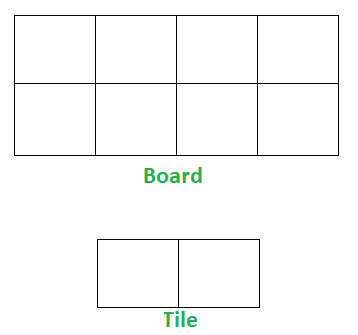 Given a “2 x n” board and tiles of size “2 x 1”, count the number of ways to tile the given board using the 2 x 1 tiles. A tile can either be placed horizontally i.e., as a 1 x 2 tile or vertically i.e., as 2 x 1 tile. We need 3 tiles to tile the board of size  2 x 3. 1) Place all 3 tiles vertically. 2) Place first tile vertically and remaining 2 tiles horizontally. Let “count(n)” be the count of ways to place tiles on a “2 x n” grid, we have following two ways to place first tile. Therefore, count(n) can be written as below. The above recurrence is nothing but Fibonacci Number expression. We can find n’th Fibonacci number in O(Log n) time, see below for all method to find n’th Fibonacci Number. Different methods for n’th Fibonacci Number.